What happens when an organization with the express goal of defending individual rights and liberties starts silencing its own board? Lawyer and social critic Wendy Kaminer has intimate knowledge of the ensuing conflict between independent thinking and group solidarity. 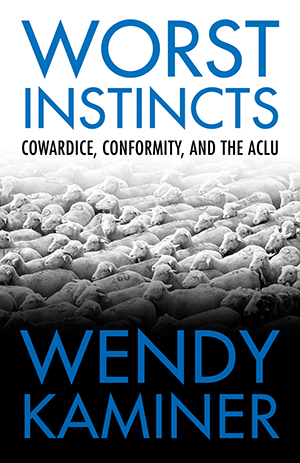 In this concise and provocative book, she tells an inside story of dramatic ethical decline at the American Civil Liberties Union, using it as a poignant case study of conformity and other vices of association. In Worst Instincts, Kaminer calls on her experience as a dissident member of the ACLU national board to illustrate the essential virtues of dissent in preserving the moral character of any group. When an organization committed to free speech succumbs to pressure to suppress internal criticism and disregard or “spin” the truth, it offers important lessons for other associations, corporations, and governments, where such pressure must surely be rampant. Kaminer clarifies the common thread linking a continuum of minor failures and major disasters, from NASA to Jonestown. She reveals the many vices endemic to groups and exemplified by the ACLU’s post-9/11hypocrisies, including conformity and suppression of dissent in the interests of collegiality, solidarity, or group image; self-censorship by members anxious to avoid ostracism or marginalization by the group; elevation of loyalty to the institution over loyalty to the institution’s ideals; substitution of the group’s idealized self-image for the reality of its behavior; ad hominem attacks against critics; and deference to cults of personality. From a renowned advocate of civil liberties, Worst Instincts is a surprising story of ethical meltdown at a revered organization that has abandoned its core principles. It is a powerful book that has much to tell us about the land mines of groupthink. Ch. 2, The Problem with Partisanship, note 2. This book is not a comprehensive expose of ACLU controversies, (which would be too tedious for me to write or you to read,) and the Beacon Press archive only documents this book; but my colleagues and I have been in the process of making a comprehensive record available in another publicly accessible archive.